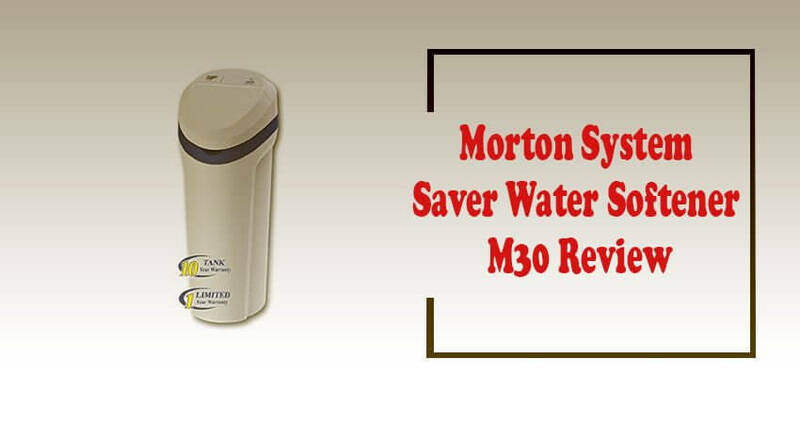 Morton System Saver 30,000 Grain Water Softener M30 is another softener for the whole house. It’s for medium to large households as well as small businesses with serious hard water problems to solve. Morton, the salt company, makes softeners that use salt. Features of the M30 are exceptional. With a unit that uses salt, you actually remove the excessive minerals—mostly calcium and magnesium—that make water hard. Ion exchange chemistry is what causes the chemical makeup of your water to change. Multiple thousands of micro resin beads hold the electrical charges of sodium. When these beads are regenerated from the salt in the system, they attract the calcium and magnesium found in high levels in hard water. The sodium ions are then exchanged. You truly soften your water—you don’t just crystallize and flush hard water minerals. The advantage of real ion exchange is truly experienced where hard water is severe. However, you must regenerate the beads, and you must supply the system with salt. The Morton M30 removes up to 30,000 grains of hardness per 13 lbs. salt. You end the damages of hard water. Skin and hair cease to be dry and dull. Dishwashing and laundry results are much better as soap works the way it’s intended in softer water. And no limescale blocks pipes now. As for drinking, the Morton M30 does not filter water. It only softens it. But, water taste and smell are better. After the softening process, your water will hit a rate of flow at over 11 gallons per minute. The Morton M30 is the single tank type. Soft water is ready when needed but not around the clock as with a dual tank type. With a single tank, you do not need block salt. Granulated salt or table salt works fine. And maintenance is less with less in the way of components. The M30 is also a space saver as it’s only a single tank unit. It measures 17 x 21 x 43 inches and weighs 95 lbs. So you do not need a lot of floor area—only 1.3 sq. ft. Uses the much more efficient Demand Initiated Regeneration. Regeneration does not happen because of a timer, but only when the resin beads are depleted. And greater softening capacity comes into the system when regeneration happens at full depletion. The Morton softeners are so efficient that you need only half the amount of salt required by other name brands. The Morton System Saver M30 saves water, too. It uses what the manufacturer terms “Look Ahead” technology. This appliance is able to monitor, address future use, and apply your household water use patterns to its output. And it can adjust to changes in water use in your home with its “Recharge Tonight / Recharge Now” button. Result: savings of water, energy, and money. And enough soft water even in high demand times. You do not need to pay a professional person to set up the M30. Just use the kit that Morton packages with the appliance, and follow the instructions. The kit comes with a bypass valve, step down conversion nuts, bolts, washers, and connectors to your copper plumbing. You also get a 20 ft. drain pipe plus a 120/24 V AC adapter. Yes, the Morton Salt people are the same people who make water softeners—the ones that use salt. In 1951, Morton started making pellets for softeners. In 2002, they introduced their System Saver model of softening unit. The company’s softeners are praised for their design, fiberglass materials, and functionality. Morton continues to make several types of salt to address different chemical compositions of hard water. Choose a salt based on your water hardness level plus the salt’s efficiency in ion exchange. The company answers customer questions at mortonsalt.com. The M30 sells for $432.03 plus $47.95 shipping on Amazon. Morton backs it with a 1-year limited warranty for parts and workmanship. They offer a 10-year warranty on the tank. Requires only 1.3 sq. ft. of floor space. How much salt does it require? Cost of the salt? 1 to 2 40 lb. bags per month at a cost of $6 to $8 a bag. You get great quality and excellent technology and design for the money. Plus a trusted name and an experienced company. Many endorse the M30, and so do I. You get skin and hair health. Brighter, whiter clothes. Dishes cleaned well without spots.